Florida Sen. Marco Rubio went after Republican presidential front-runner Donald Trump in Thursday&apos;s debate and gave his strongest performance to date five days ahead of the Super Tuesday primaries. Trump, flanked by his two closest pursuers, Rubio and Texas Sen. Ted Cruz, showed the same bombast as he had in previous debates but was knocked off his game by the Rubio&apos;s relentless attacks. "Rubio made it clear that this is a two-person race and made it obvious that Kasich and Carson should drop out imminently. "Cruz largely left the field wide open for Rubio to run the ball time after time that he created serious doubt about whether he will be able to carry many of the southern states that are key to his nomination." Rubio just won the debate with the crack, "He thinks the Palestinians are a real estate deal." "Ted Cruz is moving towards a libertarian foreign policy and is more Rand Paul than Ronald Reagan." -- Richard Grenell, former U.S. spokesman at the U.N. and former national security spokesman for Mitt Romney "Conventional wisdom would say the lack of specifics in Trump's plans to address health care, foreign policy, spending and Supreme Court nominees would be big news and could sway scores of Super Tuesday voters. "Of course 2016 has been anything but conventional but today's endorsement by Tennessee's popular Governor Haslam could help solidify Rubio as a solid second here in Tennessee. -- Mark Braden, a Tennessee Republican operative who has managed Senate campaigns in the South and worked on John McCain's 2008 presidential campaign. He backed Chris Christie before the New Jersey governor suspended his campaign. "The debate was hardly the high water mark of democracy, but it was a necessary exercise in exposing Donald Trump's many weaknesses. He is used to being surrounded by a legion of yes men, not to being questioned. "It was obvious he couldn't handle the attacks from Rubio long before he jumped the shark in calling Cruz a "basket case." Vapid verbiage tripped up Trump and he failed while Rubio excelled and Cruz managed." -- Pete Seat, former spokesman for President George W. Bush and a GOP consultant in Indiana "I think every candidate's goal tonight was to become the candidate worthy of challenging Trump. "It’s obvious Rubio passed that test tonight. He had the strongest exchanges. He had the key moments in the debate where he stood up to Trump. Went toe to toe with him and got the better of him in several occasions"
"Cruz some good moments but he got lost at times. "Headed into Super Tuesday, Rubio seems to have taken the step up and offering himself as the alternative to Trump. "I think Trump did ok. He did not do great. He did not collapse. He definitely did not demonstrate any real depth on issues. But it hasn't hurt him before and hard to see how it could start hurting him now." Makes you wonder what could've/would've happened had Cruz & Rubio stood up to Trump from day one. "The best debate yet. That being said, this race is over. The debate confirmed two things. Number 1, Donald Trump loses a one-on-one race with both Ted Cruz and Marco Rubio. Number 2, it's too late. Both Cruz and Rubio have earned the right to stay in this race and fight for delegates and as a result of that dynamic, Donald Trump will be the Republican nominee." "The Rubio-Trump exchange was exactly what people were hoping for: smart, vicious, Wu Tang Fists of Fury takedown of the center of Trump's ego. 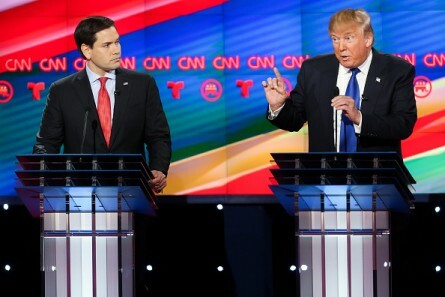 "Rubio dismantled Trump, never let him get into his safe zone, and left Teflon Don reeling. Trump ended up defending Planned Parenthood, flailing on his shady business practices, defending his skeezy Trump University scam and lost the night in a haze of rapid-fire blows he never saw coming. " Tonight was the night Marco became the GOP candidate against Trump. It was over in the first 10 minutes. Cruz fought valiantly, but Marco won the night." Eric Garcia, Simone Pathé and Eli Yokley contributed to this report.